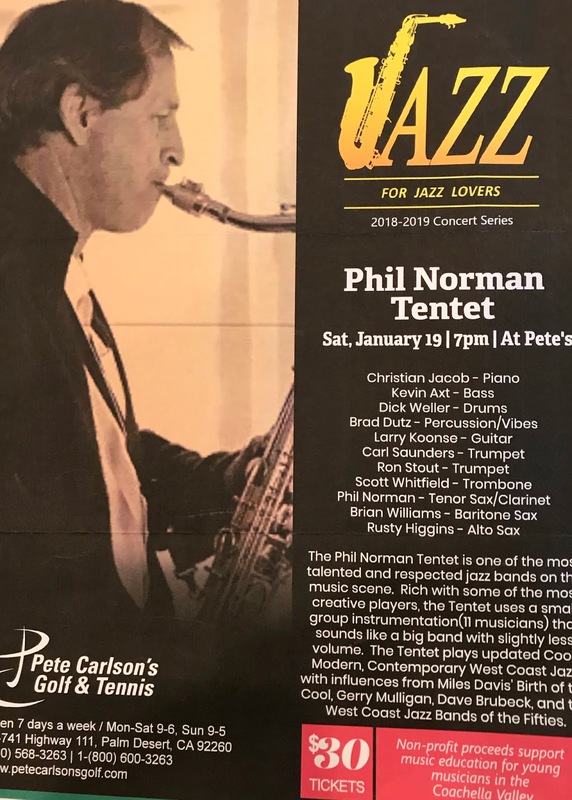 I would venture that any real Jazz fan living in Southern California knows that on Saturday nights the only place to be is at Peter Carlson's Golf and Tennis Store in Palm Desert, CA. During the day, Pete's place is one of the biggest and best golf and tennis stores in the country but on most Saturday nights, Pete's team cleans out the golf bags and golf clubs in one room and as if by magic, it turns into a Jazz Club! Pete rolls out a baby Grand and then it's straight-ahead Jazz for the night. Pete has been hosting these world-class Jazz sessions since 2010. 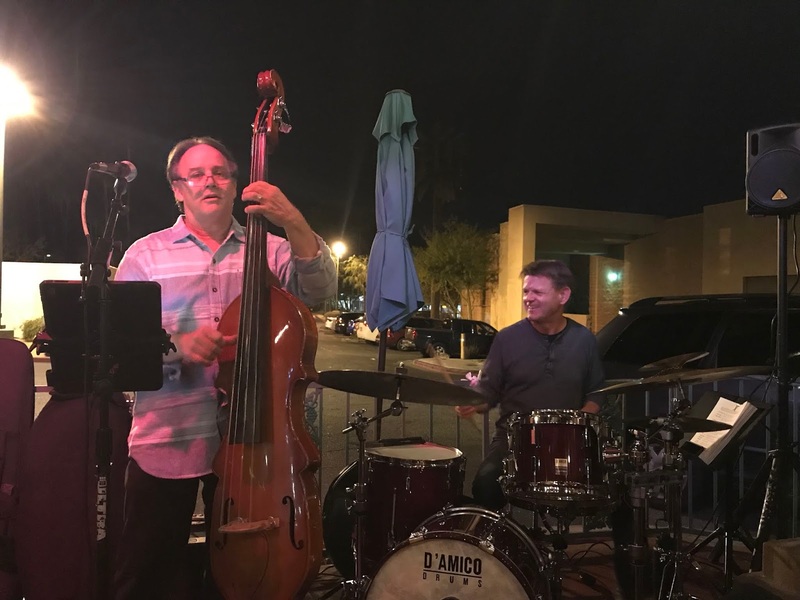 The proceeds from these 30 or so concerts each season go to support music education and scholarships for young musicians in the Coachella Valley and the American Jazz Institute. It's a great win for everyone. Jazz lovers get to hear the best current live Jazz in the Country, and the kids get financial support to keep music playing in their schools! It's a lot of work for Pete and his wife Edna, but it is a labor of love! 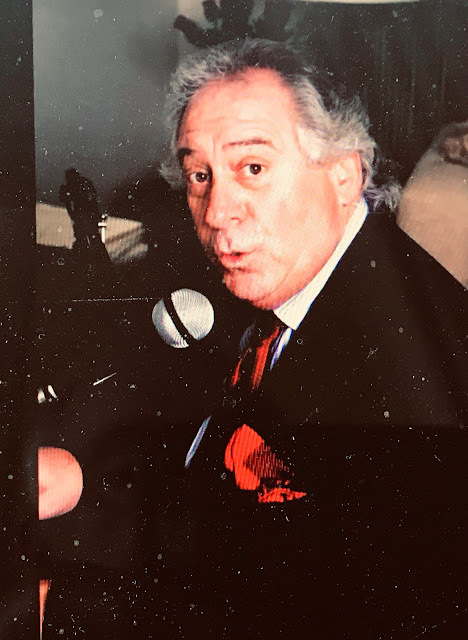 Pete is also a founder, director and broadcaster at a new local 24-hour Jazz radio station right here in Palm Desert, KAJI 95.3 FM. For anyone not living in this area, you can tune in to the station by logging onto your computer at www.amjazzin.org. The radio broadcasting legend, Alan Schulz is the program director for KAJI and also hosts his own show. Alan has spent the major part of his life involved in the Jazz world and has wonderful stories he shares about every Jazz great, past or current. Tonight Pete hosted "The Phil Norman Tentet" one of the most talented and respected Jazz bands playing today. The musicians in this band are stellar, every single one is multi-talented and a Jazz star in his own right. Take a look at the advertisement posted above and you are sure to know most of the veterans who play in this band. This wonderful band filled the house wall to wall with Jazz fans from all over the Valley and they were not disappointed. From the first downbeat, these masters of Jazz performed one great Jazz tune after another. The arrangement charts were also as good as it gets bringing memories of the great bands from years ago. Mark your schedule for next week, Saturday, January 26 when the outstanding flutist, Holly Hofmann, will be joined by the Mike Wofford Quartet. The band played many great songs last night, but I particularly enjoyed their arrangement of "Surrey With The Fringe On Top" and I have attached a "YouTube" of the band performing it. 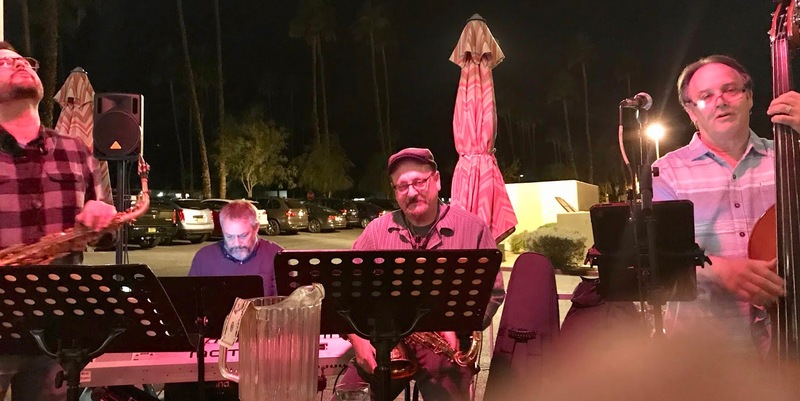 David Ring, Shelley Yoelin and Andy Fraga Jr.
Woody's Palm House in Palm Springs is a great spot to hear live music any day of the week because they have live music 7 days a week. And the quality of the performers is always some of the best the Desert music scene has to offer. 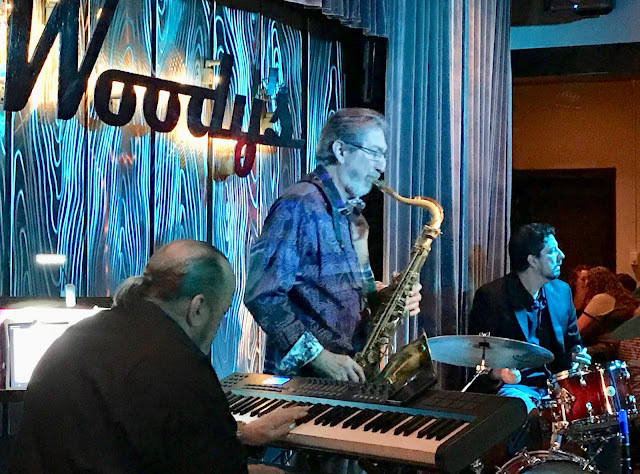 The owner of Woody's Palm House, Wayne Woodliff, is a former musician himself and he personally selects every act that performs there. Tonight, I enjoyed the Shelly Yoelin Trio that performs regularly every Wednesday night. Shelly usually invites one of our great Desert singers to be a special guest and tonight the fabulous Michael Dees joined the group. Michael has had a long career of doing studio, movie and TV work in LA until he moved to Palm Springs a couple of years ago. His singing and his original compositions are top draw. He is simply one of the finest singers on the scene today even though we only get a few chances to hear him sing locally. I try never to miss one of his gigs. 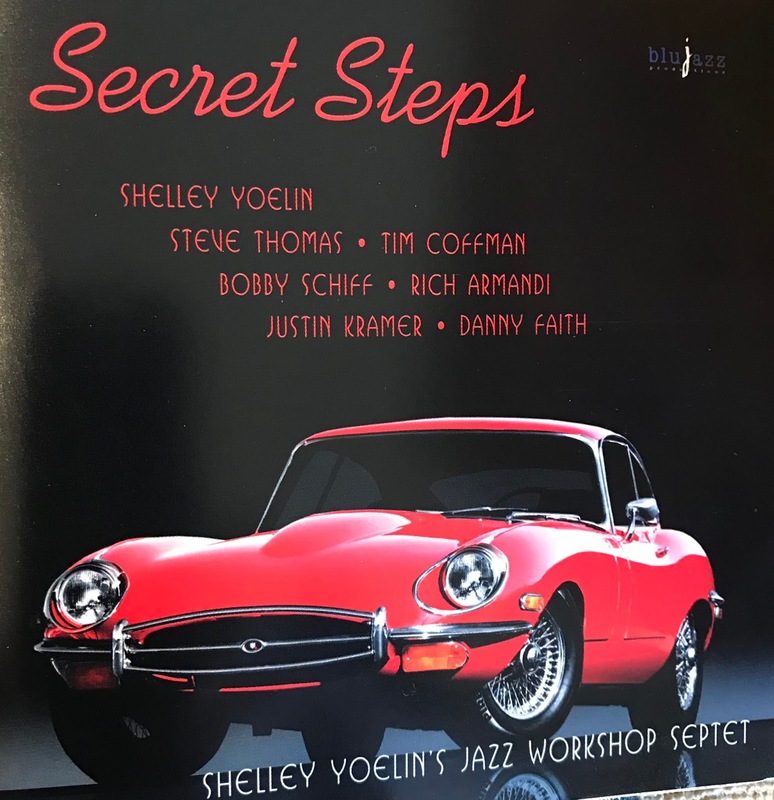 Tonight Michael vocally joined the Shelly Yoelin Group consisting of Shelly Yoelin on Tenor and Flute, David Ring on Keys and Andy Fraga Jr. on Drums. These are three of the most talented musicians anywhere and when joined by Michael Dees, it's magic! Michael sang many songs tonight including the evergreen "What Are You Doing The Rest of Your Life" the song Michael sang for the movie "The Happy Ending". Michael also sang several beautiful and sensitive songs he wrote the music and the lyrics for, one in particular is the sensational, "In A Moment". It was a great night for quality music! I recorded Michael singing a swinging version of the classic "All or Nothing At All" at the event. I was recording from my table and caught some of the crowd sounds but I think you will still enjoy Michael Dees and the Shelly Yoelin group. Enjoy!